Introducing… the original round and heart shaped cribs. 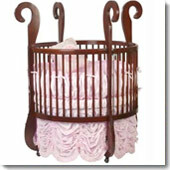 For the ultimate in nursery splendor, choose a Miss Liberty Crib today! Created to fill a void for magical cribs, these nursery showpieces are proudly made in America with safety, practicality and beauty in mind.